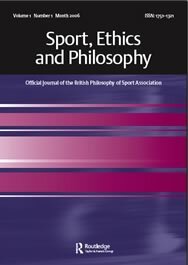 Sport, Ethics and Philosophy is the official peer-reviewed journal of the British Philosophy of Sport Association, published four times a year by Routledge Journals, an imprint of Taylor & Francis. It publishes high quality articles from a wide variety of philosophical traditions. The journal is particularly open to essays of applied philosophy that engage with issues or practice, policy and scholarship concerning the nature and values of sports. Fundamental essays in philosophy, as they inform our understanding of sport and related practices, are welcomed as are theoretical submissions from cognate disciplines. More information on the journal, including author submission guidelines, can be found on the journal’s official website. Please note that members of the British Philosophy of Sport Association receive a free annual print subscription to the journal. Please go here for more details on membership, including a sign-up form.